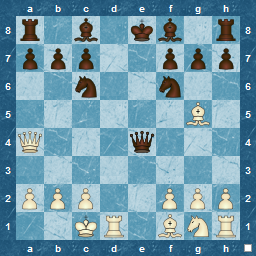 I was looking at the Chess Cafe Books of the year nominations, and saw a new nomination, namely Tactics Time! 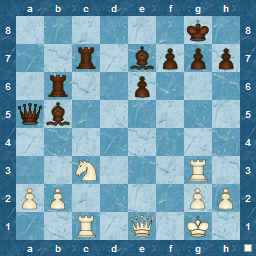 1001 Chess Tactics from the Games of Everyday Chess Players by Tim Brennan. This reminded me of what I started a couple of years ago, namely using Chess Assistant to find errors in my games and possible tactics. So I did it again, and its quite fun ! I'd have to refine it, and spend some time looking at the results, but the initial run was interesting. Here was an example of what I found,. Its a typical sort of blunder that us patzers make, and similarly the type of simple tactic that we should be spotting ! 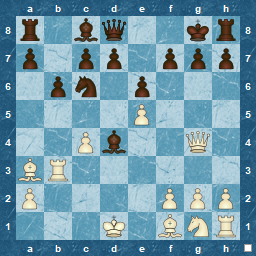 White has chased the Black Queen, and has played b5. Black has just re-captured with the c-pawn. 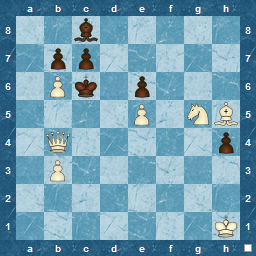 In the game, White replied with Rxb5. Is this a good move ? If not, what should he play ? Chess Cafe Book of the Year ? That time of year is coming around again : 2012 will be assessed and categorised in all areas that we can think of, and that includes chess ! As always, the Chess Cafe site has put up the first batch of nominated candidates ( with more to come no doubt ). Looking through the suggestions offered so fa,r I hope that an opening book is not selected. I have no doubt that Watson's latest French Defence book is detailed and precise, but I would rather these sorts of awards showcased the less theoretical ( and obsessive ?) parts of the chess arena to encourage us amateurs to think outside the opening phase of the game. Unless I'm allowed to include the original and excellent edition of Martin Weteschnik's Chess Tactics from Scratch, I own only one of the current candidates, Tim Harding's detailed and intriguing look at Eminent Victorian Chess Players. I enjoyed what I have read so far ( I started with Captain Evans, but then jumped to Lowenthal and Zukertort ) and would recommend it , but I somehow doubt it will win, being a touch too specialised. Reviews of the Nimzowitsch biography ( Aron Nimzowitsch, Path to Mastery : 1886-1924 by Per Skjoldager and Jørn Erik Nielsen ) are resplendent in praise for it, so despite it being more history/biography than pure chess, I would give that a great chance of success, since it deals with a giant among chess players, and seems well on the way to being the standard work on Nimzowitsch's life. 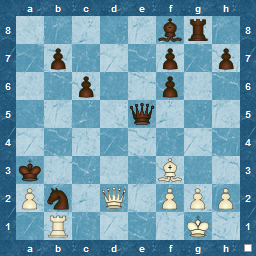 The Hawkins book ( Amateur to IM ) has had many good reviews, and seems to offer a good mix for a winner, consisting of a good tale ( his progress to International Master and now Grand Master in all but name as he is rated 2507 at present ), plus how he did it by a focus on endgames : both feelgood and didactic ! In the same mould, I would expect that a similar book from Matthew Sadler, explaining his preparation for his "chess comeback" , will also appear as a candidate soon, as he is a very readable author, although I admit, I haven't seen the level of reviews that the Hawkins book has. However, I suspect that the provocative and perhaps controversial Willy Hendriks offering ( Move First, Think Later ) may well grab the prize, even though it has already won the ECF award. This is a book that has generated a lot of interest and discussion, as it seems to indicate that intuition probably plays a large part in chess than previously thought ( although no doubt structured by a huge chess knowledge in the case of Grandmasters ! ). A short opinion is here, a longer one here. For us lazy amateurs, this also appears to offer the ideal antidote to the 10,000 and more hours of work that we should put in to make master-level, but I have no doubt that amongst his anarchistic and provocative words, he will also tell us that guessing ( which is what my intuitive move would be currently ) is no substitute for the insight that hard work brings ! I'll have to wait until 23rd January and see what the result is ! 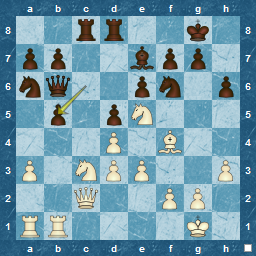 I would guess that in a game situation, I might well play the wrong move for white, but as it was in a series about knights, I didn't. Don't know exactly why, but this puzzle took me almost three minutes to solve. Usually its less than a minute for this type and level in CTB, but I became fixated on NxB as part of the solution, and kept trying to make it work. Once I moved away from that thought, the answer was very quick. Possibly this was because I had spent the previous 30 minutes on Knight mates and tactics. Here's a study from 1869, by William Grimshaw. Took me a while, and I thought it was a mistake, as I found a mate in four, but no, its mate in 3 !